GOODING, an international touring rock band managed by 4 Entertainment, has signed a distribution deal with BFD, a boutique independent distributor with a global sub-distribution arrangement with Sony Music Entertainment’s The Orchard. 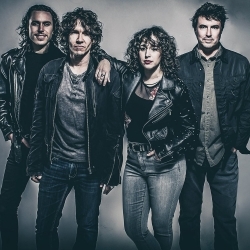 New York, NY, January 15, 2019 --(PR.com)-- GOODING, an international touring rock band managed by 4 Entertainment, has signed a distribution deal with BFD, a boutique independent distributor with a global sub-distribution arrangement with Sony Music Entertainment’s The Orchard. The band’s first release through BFD is “Building the Sun,” a 11-song album produced by Matt Wallace (Faith No More, Maroon 5, O.A.R., The Replacements, and Train). BFD will implement a distribution marketing strategy that increases the Band’s brand awareness and spurs sales via online promotion, including music streaming services, and procuring television, film and other commercial licensing opportunities. The band GOODING, which includes Gooding (Guitarist/Singer/band namesake), Erin O’Neill (guitar/vocals), Jesse Reichenberger (drums) and Billy Driver (bass), blasts a majestic, soul-stirring indie rock with soaring harmonies and blazing guitars. The band’s release of “Building the Sun” will be supported with a 2019 Spring Tour that includes over 50 dates, including clubs, festivals and schools. About GOODING: The Nashville-based band GOODING have previously released four studio-recorded and one live album. The band tours the US, UK and Canada over 7 months a year. They have played every state in the lower 48. Festivals include: Voodoofest, Sunset Strip Music Fest, Wakarusa, SXSW, Dfest, South Park, Wichita Riverfest, Little Rock Riverfest, among others. About BFD: BFD was formed in 2013 and currently represents over thirty companies with thousands of masters including Righteous Babe, Bluehat, DPTV, Astor Place Recordings, Big Deal Records, A-Train Entertainment, The Atlantic Screen Group (Filmtrax), the Royal Edinburgh Military Tattoo, and United For Opportunity, as well as artist owned labels and catalogs such as Dale Watson, Dave Davies and Charlie Daniels. About 4 Entertainment: 4 Entertainment is an entertainment business, marketing consultancy and management company that leverages its international business expertise, extensive contacts, and innovative strategies to expedite clients' objectives, create strategic partnerships, and achieve profitable results. The company provides advisory services to individuals, brands, companies, and new and established entertainment talent.